Romantic rural retreat - a perfect place to unwind. Enjoy the peace and tranquillity of the countryside; breathe the clean air, listen to the birds and the cicadas and enjoy the breathtaking views of the tranquil valley, and beyond, spectacular views of the rolling Algarve hills and glimpses of the sea. This is a tranquil and unspoilt area abundant in olives, almonds carobs, oranges and lemons (just smell the orange blossom!). There are quiet lanes and tracks for walking, and spring time, the fields are full of an abundance of wild flowers. The cottage has 2 double bedrooms, two newly renovated bathrooms, living area, open plan kitchen and dining area, leading onto a shaded terrace with honeysuckle covered pergola and barbeque. Beyond that, the secluded landscaped garden and the beautiful pool. Newly modernised bathrooms and kitchen (including new AEG appliances, dish washer, washing machine, microwave etc.). Heating system: Electric radiators in living room and bedrooms. Wood burning stove in the living area. A contact person lives nearby and is on hand to answer any questions. The pool is cleaned once a week. Linen and towels are provided, however please take your own beach towels. Changeover Day: Saturdays. Arrival times - from 3 pm, departure times - by 10 am. Stereo-System including dock for I-Phone, I-Pod etc. 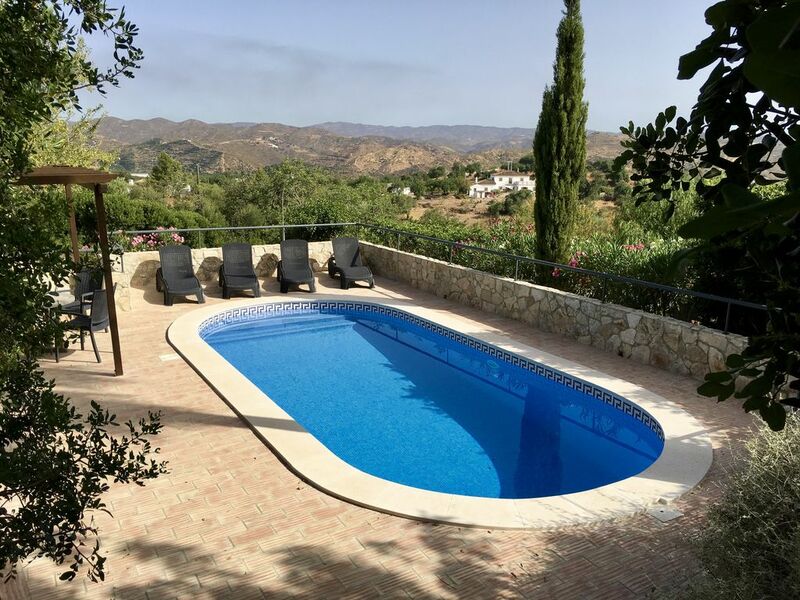 We arrived and found the villa had been updated with a new swimming pool and tiled surround; very airy downstairs double bedroom with ensuite bathroom and now four different outside dining areas. The house is very well equipped to a high standard. The position and outlook is tranquil with wonderful views over the hills and towards the sea. Spent 10 days in Casa Boa Vista which is in a tranquil setting with magnificent mountain views. Unfortunately the lounge area is very poor with a two seaterr couch and two unusable chairs so only comfortable for two people despite having two bedrooms. The promised housekeeping/change of linen after 7 days never materialised and we were left without water for half a day even though we told the owners agent that the drain on the water was being caused by a faulty ballcock. It was unfortunately inferred that we were using too much water. The water problem was a result of the installation of the new pool. It has been fixed within a day. Housekeeping new linen etc. is supplied every Saturday unless the guest only stay for less than a week. Usually rent is only offered from Saturdays to Saturdays. So this is not an issue going forward. This was our second holiday at Casa Boa Vista and the villa has been upgraded (not that it required improving) by the addition of a third bedroom with en-suite and beautiful rooftop terrace with views of the hills and the sea. This is the most tranquil spot in the wonderful Portugese countryside for the most perfect romantic/relaxing holiday, while the towns and islands of Tavira and Olhao are only a short distance away and are fascinating to explore. the owner's father is available in the adjacent villa with a friendly welcome and advice and this property is very highly recommended for anyone wanting a perfect holiday away from loud tourist resorts. Casa Boa Vista is situated on the top of a hill looking over the Asseca valley with breathtaking views on the hills and the sea. Only 5 minutes drive from the beautiful historic town of Tavira, with its river, churches, art galleries, restaurants, bars and supermarkets. The nearest beaches are Barril, Fuzeta, Tavira Island and Cabanas, the nearest is approx 10 mins drive. Tavira Island has been voted one of the top 10 in the world for families! All of the beaches are on the 'Ria Formosa' nature Reserve and are thus very clean with excellent facilities. Places of interest include local east Algarve villages and small towns, such as Sao bras, Vila Real de Sto Antonio, castro Marim, and further afield, Mertola, Alzejur, Serpa and Beja in the Alentejo. From this property it is easy to take a day trip to Spain. The lovely border town of Ayamonte is not far by car (only 20 minutes), and once there you can sample the delights of another country, including wine, tapas and excellent shopping. For more adventurous the vibrant city of Seville is approx. 90 minutes away. Nearby are three very good small restaurants serving excellent reasonably priced meals. This is a perfect accommodation for golfers wishing to sample the excellent courses situated in the Eastern Algarve. Within a 20 km radius there are 7 courses to choose from. Benamor and the 2 Quintas (Ria and Cima) are the most popular and can be reached within several minutes. The prestigious new course of Monte Rei designed by Jack Nicklaus now has its first 18 holes open. Only 10 kms further on towards Spain, the challenging course of Castro Marim along with its famous country club comes highly recommended and just across the border are the Costa Esuri and Quinta do Vale courses now growing in popularity.